Easy crocheted spike stitch is probably one of many crocheters favorite methods. But of course, it all depends on the project! We love the flexibility of this method because of how versatile a stitch it is. It actually means you can create a variety of different textures and designs by using this simple technique! 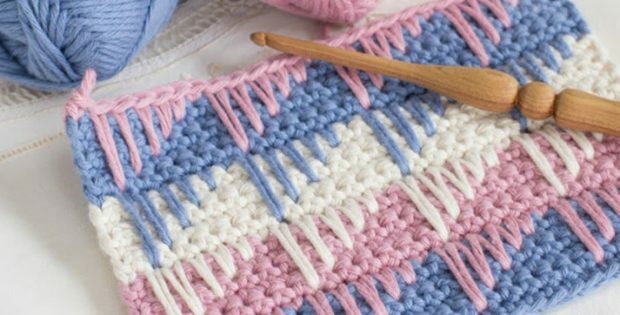 Any beginner level crocheter will love learning this technique because it is a lovely addition to their crocheting skills. Olivia created this pattern on how to easily use crochet spike stitch and even added a very easy to follow video. Access the FREE guide for this wonderful crochet skill of spike stitch with the video from her website and start crocheting today! Featured image(s): Hopeful Honey, thank you! Watch the great video tutorial from Olivia and learn how to easily crochet spike stitch!